Cutting the cake from a photography perspective has always seemed a bit stilted, stand here, get the knife, smile please, do it again, look at the camera. Eurghhh it really doesn’t capture any feeling or say anything about the people there or the day itself. 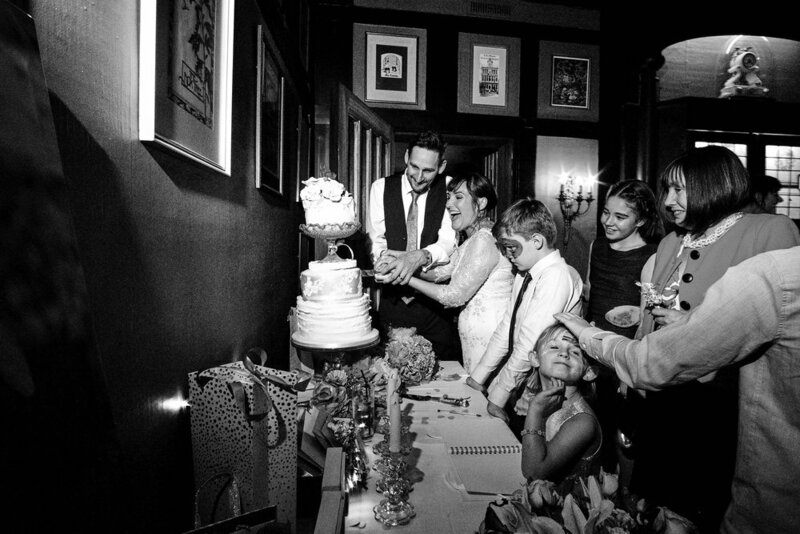 So here we have a non-traditional cake cutting picture, I love how everyone is crowded round, really sharing the moment with Sara & Paul, everyone together being part of it - surely that’s what a wedding is about? the togetherness and the memories that brings. I’m there to get that feeling, the natural happiness and interaction of people. Cutting the wedding cake at the Belle Époque in Cheshire. Photographed documentary style.